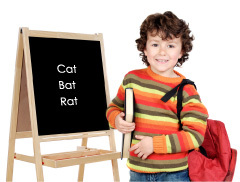 Make Your Phonics Instruction Fun! Tired of teaching phonics through boring worksheets and repetitive drill? Action Factor’s Sing Your Way Through Phonics Program CDs, Mini-Charts, and Read-and-Sing books help kids build reading foundations by capitalizing on their natural playfulness, energy, and creativity. Dedicated to the principle that children learn best when they are actively involved, we ask these questions: As a child, would you rather learn phonics through rhythm and song or through workbook exercises? Would you rather prepare for a test by playing a game or through traditional study and review? Action Factor answers these questions the same way you do. View and listen to our easy-to-use phonics education products and check them out for yourself! View the Scope and Sequence of our products for a detailed description of the concepts covered in each volume of Sing Your Way Through Phonics. Teachers, to see how other educators use our products, check out our How-To for Teachers page. Parents, would you like to help your child become a better reader and writer? Our Parent Guide can help you select the right product for your child’s needs. For guidance on how other parents use our products, visit our How-To for Parents. Our Combos combine a Sing Your Way Through Phonics CD (available in either teacher’s voice or children’s voices) and its associated Mini-Charts with a single volume Song Lyrics Booklet at a reduced price. A helpful Teaching Suggestions Booklet is included with each combo. Classroom Ensembles combine multiple volumes into a cost-saving package. The 4-Volume Ensemble Complete contains the Ready to Read Combo, plus Volumes 1, 2, and 3 Combos. The 3-Volume Ensemble contains Volumes 1, 2, and 3 Combos. All Ensembles include music CDs, Mini-Charts, Teaching Suggestions Booklets, and reproducible Song Lyrics. Our Read-and-Sing Books keep students smiling as they follow along and join in the lively phonics learning songs. Priced for convenience and economy, the Read and Sing Complete Collection includes all 11 Read-and-Sing Books with their music CDs at a price that is lower than the cost of the individual collections or books. Also available are the 6-book Letters & Sounds Collection and 5-book Early Words Collection. These collections provides a foundation in phonemic awareness and early phonics that is crucial to early literacy - an excellent enhancement for the Sing Your Way Through Phonics Volume 1 Combo! Take a look inside When Santa Got Stuck in the Chimney. This delightfully illustrated cumulative tale of Christmas mishap is a take-off on the familiar nursery rhyme, The House That Jack Built. With text that guarantees successful reading, even for beginners. It’s easy for children to read along as each new page recaps all the familiar links to Santa’s dilemma.